LHD vs RHD - that old chestnut. We discuss the pros and cons of left-hand drive cars, should you convert them to RHD and challenge the perception that the market for LHD cars is really much larger. Have you ever thought about buying a left hand drive car to own and drive in the UK? 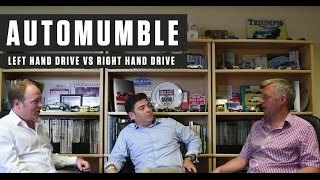 As part of classic car insurance specialist Hagerty’s regular Automumble series we discuss the pros and cons of owning a left hand drive car in a right hand drive market with John Mayhead and Charlie Paterson. Over the last few years we have seen a large number of European market left hand drive classics enter the UK and many of our customers ask whether they should consider buying a LHD car – mainly because they perceive them to be slightly cheaper and potentially easier to sell in the future. The reality is complicated – as you will hear in the video. European collectable cars have arrived in their droves but LHD cars have fallen out of favour with many dealers, US muscle cars are often preferred in their original LHD US spec by British enthusiasts and British sports car that were exported to the States in Left hand drive are often repatriated and then converted back to right hand drive. LHD vs RHD – how we see it. Left hand drive cars are less fun to drive in the UK – simple. They are of course great on the continent so if you drive there regularly then LHD is a good choice. Collectable classic and supercars are worth less here in the UK if they have the wheel on the left hand side and many classic car dealers are less inclined to stock LHD cars as there is less demand for them. LHD should be considerably cheaper in the UK than RHD cars – this isn’t usually the case. The LHD market outside the UK. It is clearly true that the market for LHD is larger than for RHD in terms of sheer volume, but far fewer RHD cars were built making them rarer. Selling a car privately from the UK into another market isn’t easy. European left hand drive classics have been coming to the UK because the market for those cars in their home territories is weak. Just under 40% of the world’s nations drive on the left and while most “first world” nations drive on the right some of the world’s fastest expanding economies drive on the left so where the greatest potential lies is anyone’s guess. The main principal that should guide your choice is how much you are going to enjoy it rather than how much you might sell it for in the future.